By CandidCupcake on September 25th, 2012 . Filed under: Cupcake Ideas . I am not a seamstress at all, so I am always on the look-out for Halloween costumes that require little to no sewing skills. 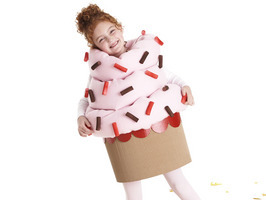 I would definitely give this one from the Food Network Magazine a try, but I’m not too sure how my little boy would feel about being dressed as a cupcake.